A 200-page report that was made by the Hamburg Media School and the University of Leipzig, ordered by the respectable Otto Brenner Foundation. represented an analysis of the behavior of the German media during the mass flow of illegal migrants into Germany in 2015-2016. Taking into account its scope and negative consequences, social jihad in Europe can also be considered historical. It turns out that journalists, who forgot objectivity, supported the official point of view by mistake - "We will cope" - and imposed a "culture of hospitality" for Germans, are guilty of this migration flow. The official Deutsche Welle(DW) says that the media employees "did not do their job well, could not disclose and cover the situation from different sides." The Deutsche Welle notes that such accusations have been heard "only from the right-populists of the" Alternative for Germany "(AdG) so far, but now the German newspapers and their reports on refugees are even actively criticized by a serious scientific institute." We will offer our version then, what this could mean, but now let’s turn to the main "claims" made toward the German colleagues. After analyzing thousands of articles of the largest and leading German media such as SüddeutscheZeitung, Frankfurter Allgemeine Zeitung, Die Welt and Bild, as well as 85 regional newspapers, the authors of the report concluded that the editors of the media took on the role of "people's enlighteners" instead of finding out what kind of "refugees" suddenly came to Europe from all over the world. Moreover, they tried to ensure that critical remarks about the flow of "refugees" during this period seemed like "xenophobia". Researchers confirmed: the opinion of the Germans, who " were skeptical or critical regarding the actions of the government for various reasons," was not sufficiently represented in public debate. However, the media actively used their propaganda machine to promote the ideas of Merkel’sgovernment about “culture of hospitality"." Articles on "refugees" suffered from excessive morality, were overfilled with excessive sentimentality and contained only a few critical remarks. So, considering 35 thousand materials, only six percent (!) of them presented reliable news or reports. At the same time, experts, who could explain different facts, appeared in just one article out of every hundred. It also turned out that 43% of all heroes from newspaper materials were representatives of the government and political parties, who called the Germans on accepting the "refugees". Particularly, they gave a word about refugees more often to the "green" party that supported illegal migrants than to the representatives of the Left Party, which did not show their special enthusiasm in this regard, although they did not oppose it. But the AdG, which was already represented in a number of parliaments at that time, almost did not get access to the press. The authors of the study found out that "political elites" were interested in covering the topic about "refugees" in this way. Therefore, it is not surprising that 83% of the newspapers were positive about refugees, imposing a "culture of hospitality" on Germans, while the arguments of those who expressed fears in this connection were mentioned briefly. All this led to the creation of an "information vacuum" in which German society began to exist. The report states that this joyful opinion was disturbed by the events of the New Year's Eve in Cologne (however, it happened thought out the country but the media hid this information because of the authorities’ pressure), when crowds of migrants began to attack hundreds of German women and sexually assaulted them on January 1, 2016. 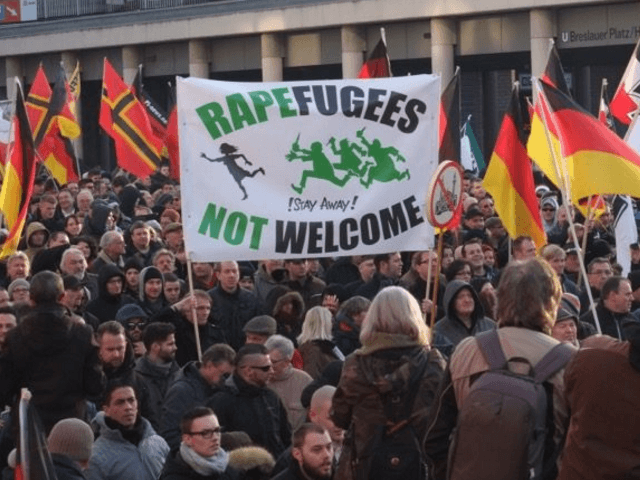 Only after the truth about the events in Cologne was disclosed and it caused public resonance, the German media began cautiously criticizing the "refugees." The authors of the study naively note in this regard: "It seems that many journalists wanted to make up for lost time, what they missed before." So, at first they "missed", then they "comprehend" and started "catching up". The Deutsche Welle concluded:" Even if this report cannot be called ideal, it seems to many people that it is a slap in the face of the German media. Probably, it could have been even more painful for the mass media if television reports had been considered and analyzed. But the experts did not have enough time for this. " What can we say in this regard? First of all, the matter is not in the position of journalists, but in government policy. German journalists have always done exactly what their authorities want from them. The government policy changed and journalists followed “the general line of the party." Yes, there was a time that had not yet passed, when the media attacked people who criticized the authorities for the policy of "open doors". Opponents of the "hospitality policy" did that not because they were cruel and did not sympathize the real refugees. Because they saw: economic migrants abuse the right of asylum, that they behave like conquerors, that they are hunters for social goods, that there are terrorists among them. As well as the fact that the aliens do not appreciate German culture and laws and firmly believe in their right to remake Germany under themselves. We can only hope that now the journalists of the German mainstream media will really work out the "debts" that have accumulated. And we are talking about changing the course, rather than pre-election political mimicry, after which the authorities and, accordingly, the media will return to their ordinary strategy. However, let's not be too strict with German journalists. They just do their job. They only act in this story as disciplined officials: they write what they are told. The TASS also published its famous statement in the same way in June 1941. Freedom of the media is a rare phenomenon in this world: for example, it has never existed in Germany; only marginal Internet media that are opposed by Fake news are free in the US. Even a super-independent newspaper Bild publishes disclosures that are never an accidental result of truth-seeking. This is always a political order. There are a number of signs that the European Union and, particularly, Germany start reconsidering the migration policy. It looks like that they realized that Europe only needs a well-skilled workforce, and it is absolutely impossible to shelter all the poor from around the world. What it is necessary to do is to help or assist thepoor to make their life better at home. This has been declared at the governmental level and inthe press in Germany. There is no accident that the EU has recently banned to deliver rubber inflatable boats to Libya, from where 5,000 illegal migrants daily make their way to Italy. The media are publishing reports about the role of "human rights defenders" fleet sponsored by Soros. This fleet together with smugglers of live goods select illegal immigrants from the Libyan coasts and take them to Italy. The next step is to suppress this dark business. Allowances for "refugees" is being tightened, there are preparations for mass deportations of persons who were denied "asylum". One of the evidences that serious changes are not far off became the study of the Hamburg Media School and the University of Leipzig..
Well, it's better late than never.